Tower Street, Hull, HU1 4DP (Sat Nav HU9 1TU). 01482 381000. Open daily 10am – 6pm (last entry 5pm). 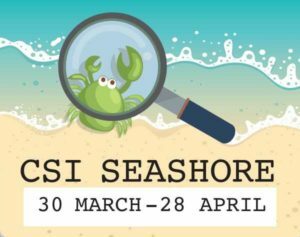 This Easter join The Deep’s special agents as they take a trip to our native coastline to find out what can be uncovered at the seaside. Help the team solve the crimes as they go and you might even earn a CSI badge of your own! Lend a hand in our interactive presentation at 11am, 1pm and 3pm, follow Inspector Sharky’s trail (available all day) and make your very own sand art (charge applies for our craft activity). Runs 30th March – 28th April 2019. The Deep offers FREE return visits for 12 months with the Day Plus Pass. Simply complete your details at reception and retain your tickets to make use of this offer. Full terms and conditions can be found on The Deep’s website.